Water jet cutting begins with the intensifier pump. The intensifier pump creates high pressure water (up to 90,000 psi) needed for cutting solid materials like metal. The pump utilizes a hydraulic pressure over water system. A large motor drives the pump, creating pressure which powers the piston into a cylinder. The hydraulic pump pressurizes the fluid and switches between the 2 sides of the piston. The pressure is created with the hydraulic piston which also creates pressure on the water in the intensifier. The pressure is maximized by the larger cylinder pushing a small piston into a water filled cylinder. Then the high pressured water flows into the accumulator. The accumulator smoothes out any pressure ripples. The water then flows through the high pressure tubing into the cutting head; The off valve controls the flow of water in the cutting head. this allows the CNC machine to stop and start the process at the right time. The pressurized water is applied to an orifice (defines & creates water streams used to cut through material). The water is mixed with abrasive as it exits the orifice for cutting harder materials. The garnet abrasive is mixed with the water inside the mixing chamber. The flow of abrasive can be controlled by using the abrasive metering system. When cutting hard material the abrasive is what actually does the cutting. 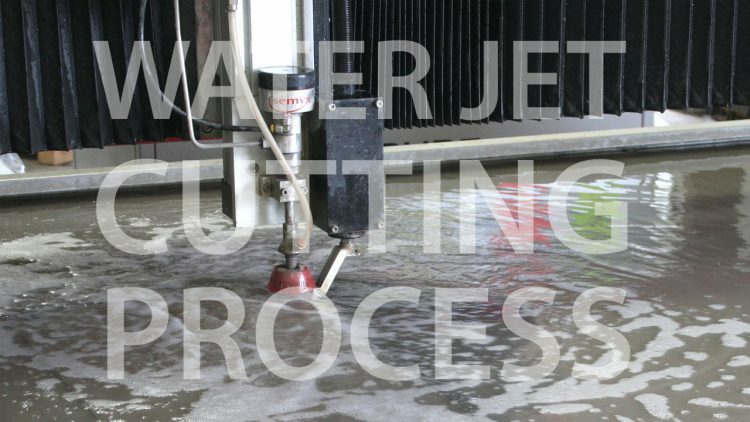 East Valley Precision offers water jet cutting services near Phoenix & Chandler, Arizona.